Always eager to break new ground in coin design and engineering, the Royal Canadian Mint has shattered the limits of relief with several impressive new coins. 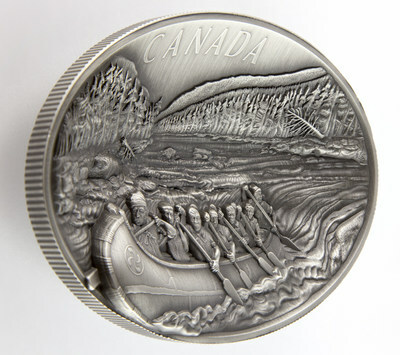 Bursting from the imagination of Mint engraver Matt Bowen is the 2018 $250 Fine Silver Coin - The Voyageurs, a spectacular 1 kilo, elliptical-shaped, concave coin struck in ultra-high relief. The dramatic scene of the intrepid trail blazers who fueled early Canada's fur trade, paddling down an untamed river, is rendered in incredible depth and dimension. This stunning keepsake, among many other innovative collectibles, is available as of today. Equally irresistible is the 2018 $100 Fine Silver Sculpture Coin - Superman[TM] The Last Son of Krypton on which a three-dimensional, gold-plated sculpture of the legendary superhero leaps from its reverse. This 10 oz. fine silver creation is the result of a collaboration between renowned comic book artist Jason Fabok and Mint engraver Mathew Porter. More examples of exceptional sculptural relief can be found on the 2018 $50 Fine Silver Coin - Whale's Tail Soapstone Sculpture which features Winnipeg artist Dave Zachary's hand-carved design of a humpback whale's flukes jutting out of a shimmering translucent blue enamel layer realistically emulating Canada's North Atlantic waters. Visible beneath this watery enhancement is Mint engraver Cecily Mok' engraving of the whale's head as the majestic creature dives to the icy depths below. A similar effect also brings to life the 2018 $30 Fine Silver Coin - Dimensional Nature: Polar Bear, which introduces the world to the Mint's exclusive dimensional paint technique. Artist Tony Bianco's illustration of a cub cautiously testing the waters from the safety of an ice floe while its mother and sibling navigate the blue ocean waters below, vividly simulates the beauty of Arctic wildlife in action. The 2018 Holiday Gift Set, featuring a holly and candy cane motif on the reverse of a special one-dollar coin. Mintages, pricing and full background information on each product can be found on the "Shop" tab of http://www.mint.ca . Coin images can be viewed here. 1-800-268-6468 in the US, or online at http://www.mint.ca. The coins are also available at the Royal Canadian Mint's boutiques in Ottawa and Winnipeg, as well as through our global network of dealers and distributors, including participating Canada Post outlets.